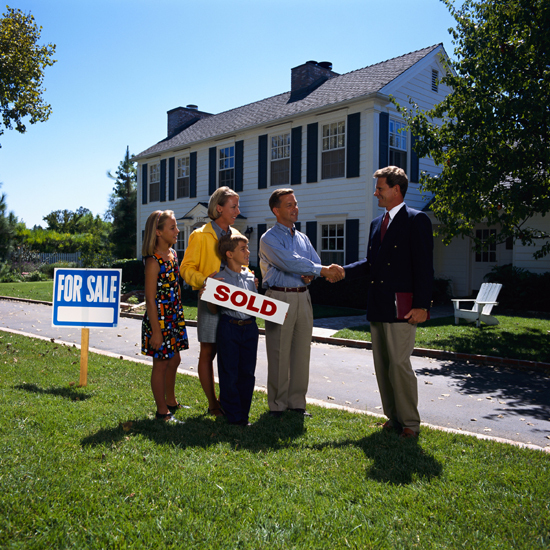 Your house is part of a general housing market. If the market as a whole is rising or falling, it may influence the value of your house in ways over which you may have little control. However, important source buy liquid accutane ALL real estate is local. The value of a house in San Diego is not affected by the number of foreclosures in Florida or the level of unemployment in Michigan. However, it IS affected by the region of the country, the specific state, the county, the zip code, the neighborhood, and even the street the house is located on. 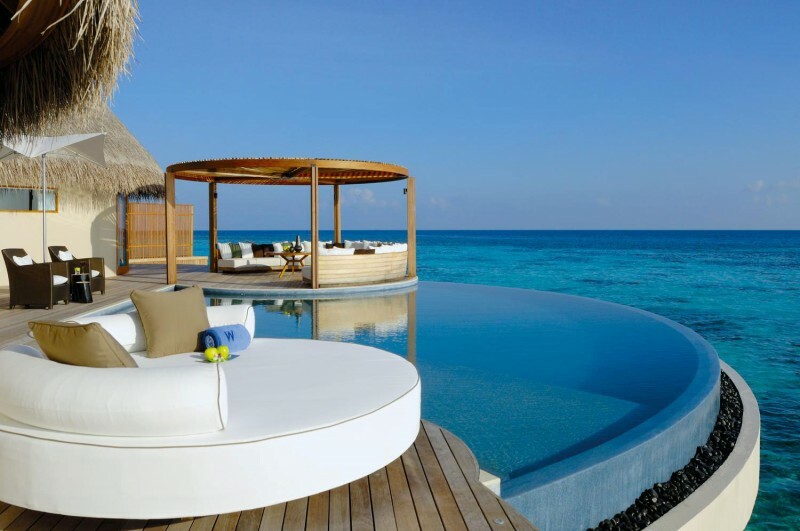 The value is further affected by the view, useable square footage of the lot, the square footage and layout of the house itself, the number of bedrooms and bathrooms, the presence of a pool, air conditioning, the recency of updates to kitchens and/or bathrooms, and the value of other comparable houses that have sold in the immediate area. You may be out of luck if a local employer has massive layoffs, a nearby lake becomes contaminated, your school district changes, or a new highway cuts through the neighborhood, but again, these are things that are largely beyond your control. The good news is house prices have an upward bias. Our population grows every year and house prices, like most goods and services, are a function of supply and demand. If there is an overabundance of supply and not enough demand, prices will fall. If there is an increase in the demand for housing and not enough supply, prices will increase. As long as people continue to want to live in America, and as long as people keep having babies, the demand for housing will continue to grow, and house prices will continue to grow as a result. 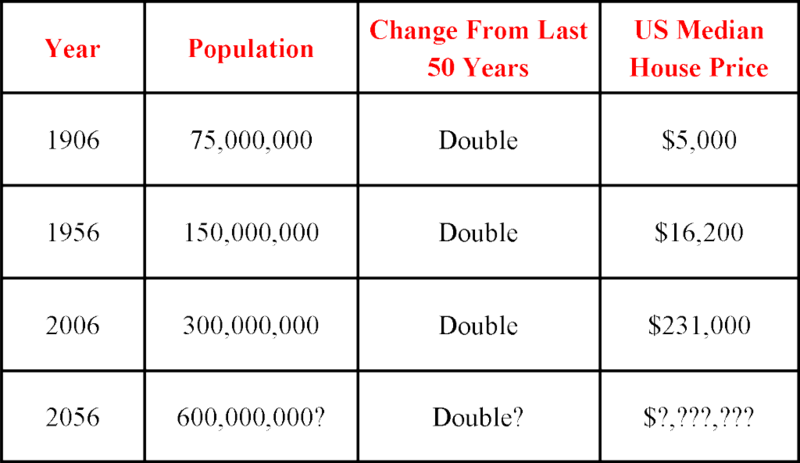 Looking at the population chart below you’ll see that our population doubles about every 50 years. However, the median house price grows at a much more robust pace. From 1906 to 1956 the median house price tripled while the population doubled. From 1956 to 2006 the population doubled again, but the median house price actually increased by 14 times. If the population doubles again from 2006 to 2056, what do you think will happen to the median house price? The value of your house is affected by a great many things, not the least of which is supply and demand. House values are also influenced by the economy, employment, lending guidelines, availability of financing, interest rates, and inflation, as well as the emotions of buyers and sellers. Various factors beyond the individual house influence changes in the value of the house. An attractive neighborhood, ongoing maintenance, renovations, local amenities, transportation, freeway access, access to shopping, and the quality of local schools all affect the appreciation or depreciation of a house. 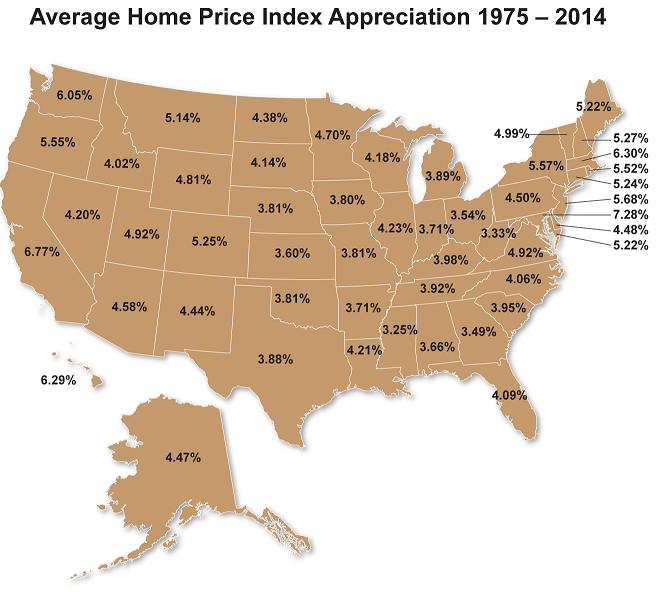 If you review the Average Appreciation by State Housing Price Index graphic, you’ll see that from 1975 to 2014 California has an average appreciation rate of 6.77%. 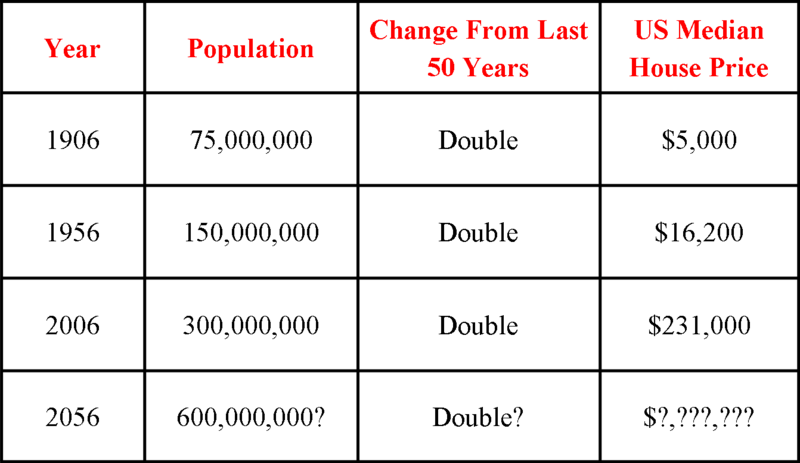 While that is an average and averages have a tendency to misrepresent or distort the facts, this graphic includes the housing dips in the ‘70s, ‘80s, ‘90s, as well as the current housing crisis through the 1st quarter of 2014, the worst of which is purported to be behind us. Ultimately, however, the value of a house remains in the eye of the beholder – the buyer. That is why we say, “The market is always right.” The buyer and the seller negotiate the final price of a house. The general market valuation helps determine the overall value to a point, but the amount that an individual buyer is willing to pay can make a huge difference in the price. If you live in a great neighborhood, but your house is in need of repair, you’ll see a drag on the overall market appreciation. An individual buyer might like your house location so much, however, that he or she is willing to pay more for your house than for a similar house in better condition, but in a less favorable location. That is one reason we often hear that real estate is ultimately about location, location, location. If you’re interested in purchasing or refinancing a house and learning more about the house as an investment and how owning a house can help you grow your wealth contact us to schedule a time to talk about your specific circumstances.